- that was Juanita's comment on this drawing. You have seen a small detail of it already and today is the day for all of it*, and some more details. 'Where the wild things live' - I was well chuffed with that title. She got the eeriness and moodiness straight away. I made it a couple of weeks ago when I took more of the handmade Arches paper to draw with pastels. The palette is again similar to the earlier one, but less limited. The marks are drawing marks with some later reworking to calm some areas and to introduce more highlights. It is less sketchy than the previous one, and - at least for me - a fair amount of time working and reworking was spent on it. I was meaning to write-up more on Wolf Kahn's approach to landscape as subject matter along with this post. But: I left my notes on that in a notebook in Glasgow, while I am - again - in Berlin for a week. So: the WK's landscapisms have to wait a little long. what if the detail was so much better than the whole piece??? Have this for a travel interlude along with some appropriate music. These are so local so known and yet so distant in time and place. So: what is it we see in reflection? When I came across Wolf Kahn's monotypes I was intrigued to go back to monotypes. I remembered how difficult I found the painting on the plate - remember my complaints back in autumn here? I have also been meaning to use oil paints as printing medium rather than the oil-based, washable relief inks I've been using so far. I am preparing for a couple of oil paintings of the two scenes I'm working on, but I am not quite there yet, I feel. But one way of moving towards these was trying to include some of WK's pigments of choice: notably cadmiums. I had bought cadmium reds and yellows very early on when I started oil painting but have never used them so far. There are a couple of powerful pigments I'm fairly familiar with, notably phtalos - no, that' s not right: I use them in acrylics, but have never used them as oil paints (except dioxazine purple), and I have stayed clear of the cadmiums. But, yesterday was the day: I prepared a palette, including also a pale violet grey, a pale rose, lime green, prussian and ultramarine blue and some umber to soften this in-your-face-pigment-fest. I diluted the paint with a mix of turps/stand oil, ended up wetting the paper and with the final, a ghost print, I did quite a lot backdrawing to get most of the ink onto the paper. The mix of paint/medium may need some more experimenting, but I am taken with the marks and the yellows. I also tried some reductive monotypes: inking up the plate in ultramarine and removing ink to build up the scene - with brushes, painting knives, paper towels, and at points adding more paint (also in black and prussian blue). These are very different, much more abstract and moody. I will try this out more. The way I tend to use pastels is very much like paint: I tend to treat the support as a surface made up of different shapes, colour fields rather than developing a piece of art out of lines and linear marks. I also tend to work with pastel board - usually Colorfix board in darkish purple, light blue or anything in between. When I tag my pastel pieces in Flickr or Etsy, I have to remind myself to also label them as 'drawing' not simply as 'painting'. So, although I work in dry medium I tend to say that I paint with pastels. Just recently, I begun to draw with them. 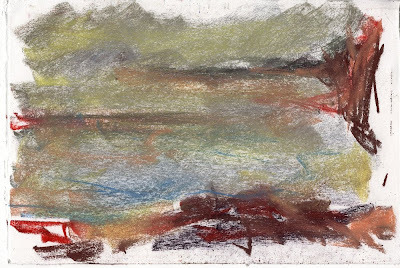 Not only that but I also reverted back to white paper as support - something I had given up as early as I could leave some sort of semi-competent mark with pastels quite a few years back. Admittedly, the paper I am using now is no longer cartridge but handmade, heavy-weight Arches paper. And: how wonderful the white paper is and what drawing marks the pastels can make! You may guess that the inspiration for this has been Wolf Kahn's use of pastels as his plein air medium of choice and my delving deeper into his palette, working process and subject matter. So, while some smaller studies in pastel and coloured pencils preceeded these (like the one on the top of this page), here are two studies of the Pond Reflections. Both use a fairly limited palette, with greens introduced to the second one. It's with these ventures outside comfort zones that I surprise myself: oh, are these really your marks? Your choice of hues? Of building up tension between different marks, hues and shapes? Hm, maybe ownership isn't the way to approach this... let me think about this a little more. It's been a bit quiet around this, but the Moley Exchange is almost finished. Just last week I received my moley back. And, how different did it look to when I posted it off in Spring. Its theme was Lines, Lineages and Linings. I started it with a quote by de Stael on the abyss opened up by lines on an empty sheet of paper and my favourite composition of the study plains. Now it acquired a multitude of different approaches to the theme, as collage, a bit of oil, pen and ink, some free-hand sewing, some pop-out men-in-skirts, some delicate pastel work and more mixed media wizardry. I remembered that one of my earliest questions to do with sketchbooks was on how to stretch their versatility. This is the main thing I've learned through the exchange: so many different ways of using the sketchbooks as galleries and experimental planes for a variety of media. And that's something I greatly appreciate and want to thank everyone involved in this! Do you want to have a look at the sketchbooks? They will be on display from Monday onwards at the Learning and Resource Centre of the University of Ulster, Belfast Campus, York Street, BelfastBT15 1ET. I am feeling rather smug. Not only did I sell my first painting via Etsy to a stranger a couple of weeks back, but it has now arrived in Alabama and has found a happy new owner (phew, was I worried about my photos and the postal service!). Yesterday I received a phone call from another stranger who wanted to buy one of my framed study plains as a birthday present. And, now I am officially in profit: the costs of the framing odyssey last summer are finally paid off. So, rather quickly, I welcomed a new necklace to my collection. Goodbye and hello. There you go. 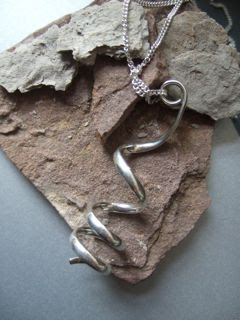 Tight Twist Pendant by Chris Lewis. While still mucking about with the relief prints (and likely to do so for another few months), I had come across these monotypes by Wolf Kahn a while back. Just last week I had ordered a couple of copper plates to use as plates for some more monotyping experiments. And following Casey's exercise of copying one of WK's paintings to learn more about the process, I think I will put this on my list of things to do. But, first, take a look at this gallery here which has many of his monotypes on display. I very much like the way how the printing medium provides a different expression in his work. "Monoprint is a term art dealers often use interchangeably with monotype. While the dictionary does not differentiate between the two, in the academic art world, the term monotype is used for work developed on top of an unaltered plate, utilizing its flat surface, whilte monoprint refers to monotype work that also includes elements of another printmaking process such as etching, woodcut, lithography, silk screen and so on." ... a short and somewhat lazy post to pick up my Wolf Kahn exploration. But a post nonetheless. Does anyone know more about his monotypes? What inks does he use, e.g.? Do you know of any publications where these are available? Have seen any IRL? ... well: none on Saturday is more correct. Excited about the prospect of some pleasure boating on Loch Lomond in proper Scottish fog, we found the pier closed. So it was a little walk around the proper park instead. And, as luck may have it: I may have found a spot for regular visits. It's an old and familiar one, indeed. But I hadn't been for a while. I don't think it'll be frequent, frequent but maybe once a month? That may get me somewhere to chime in with my fellow Watermarkers regular sketching/painting spots. So: for the March installment possibly with less fog, more green? Though I rather liked this weather - but I don't think I convinced the other two. And I came up with a fabulous research project. Not quite sure with whom, how funded and how to be specified. But it is about popular culture, the arts and recession. It is about the flip side to some of the comments I've been hearing: how great a recession is for good art. Just look at all the great music that came out of the late 70s, early 80s. Hm... True: great music. But at the same time: crisis can go terribly wrong all the same. So, those who see it as opportunity need to have good plans, networks, and ways of doing in place to see some of that through. I've been meeting a few new people recently who are working on fascinating projects around labour, employment, social relations and stuff. Some of them are historians. So, maybe there's something be done along the lines of oral history here. One of the ideas I had been kicking about with colleagues for some time is a project on how understandings and practices of works have been changing across generations in places like Glasgow. Both of these songs, Billy Bragg* and The Clash pick up on the stuff that is so prevalent now: to try and turn (un)employment into individual achievement, aspiration and employability - and the lack of it into incompetency, laziness etc. But, perhaps just as what is going to happen here over the near future, the late 1970s of course where a time where unemployment could not be reduced to immoral fecklessness. But - as the half-cooked note to self that this currently is - have another song I've been trying to get into some of my academic work for a while. And this would be the place. Na, enough Trees on Water? Or can you deal with another one? Do you recognise the colours? It's straight from Wolf Kahn's palette. I figured if I don't get round to the pastels all that much, I can do a bit of palette exploration in print. So, this is lime green and ultramarine blue. There is some intentional misalignment and some wiping back on the blue block. Good. That's that pretty much done. On to the next. It'll be a reductive lino cut. Should I chose a trees on water reflection or something new for a change? And a PS in form of a personalised message. but I have a personal preference for your choice of three? A subtle hint? How's this? M. had stayed at mine to catch an early flight and left an hour ago for a weekend in NYC... As I'm writing I so wish I could go too, and hope that no Schneegestoeber will stand in her way of getting there. Well, and as we were drinking coffee, this was on the radio. I heard it a few times before, was kept updated by my other friend M. on the words on the street of this latest offering by Morrissey. While generally being a bit hesitant about it, I listened to the lines more carefully, and grinned no end. Yes - while he may be wrapping his arms around Paris, I envy M. for doing that with New York over the next days and am enjoying doing this a bit more with Glasgow for a little while longer. But, of course not without changing Moz's line from absence to presence. Which then completely and utterly takes apart one of the key fundamentals of any of his songs. Sorry, cannae help it. And, yes, ... this here is generally about painting... have a good day! What a wonderful word. I had forgotten about it. It hadn't occurred to me in a long, long time. But when I left the department, there it was. Snowflakes. Thick ones flying everywhere and there was no way of me being able to say where they were going. So, I told M. But of course, I didn't have an English word for it. We looked out of the window. And there it was: a snow flurry. Two minutes later: sunny skies and snow flurry. Another two minutes later: all grey and more snow flurries. You know it when you see it. Even on the Scottish West Coast. Makes a different to the usual rain flurry, I suppose. Well, wait... that's not a weather word either, I think that is just miserable RAIN. A photo? Just look out of the window.